For me, the delightful tone of the Fourth Polyglot Gathering was set several days before it began. I arrived in Bratislava and was met by Michal, the owner of the apartment that was my temporary home for my first visit to the Slovak capital. He was carrying what I took to be a set of golf equipment or maybe fishing rods. It turned out to be a fujara. As you may well have known, but I didn’t, that’s Slovak for a shepherd’s overtone fipple flute. He treated me to a captivating welcoming performance. What a memorable start to a hugely enjoyable stay! Piped aboard. My host Michal on the fujara. There was some media attention to previous Gatherings in Berlin but nothing like an official welcome from the city. Bratislava – and Slovakia as a whole – feels like a more intimate place and more appreciative of new guests. The city even laid on free bus travel for Gathering attendees. So it was that the event kicked off with an official opening in the impressive Aula of the venue, the Bratislava University of Economics. There were short speeches from dignitaries including a government minister, the Mayor of Bratislava and the Rector of the University. This was the largest Gathering so far, with 458 participants from 52 countries. There were 110 talks in four tracks, running from 9 or 10 am till 6 pm over four days. The difficulty was chosing which sessions to attend. More than once I found myself rushing late through the foyer towards the lecture theatres, still undecided where to go. At least everything was recorded and will eventually appear on the Gathering’s YouTube Channel (though this may take some time – it’s all the work of volunteers). Four themes emerged for me as I wound my own path through. Ján Figel used to be the European Commissioner responsible (among other things) for promoting languages. In his talk “Diversity and unity: for effective multingualism in Europe” he expressed his sadness about Brexit but also his hope for the future enlargement of the EU. He argued that multilingualism and nurturing minority languages are more important than often realised for true European “community”. For future success, it would be essential, he said, to maintain empathy on the unmeasurable, non-material issues, such as language. They often matter more than measurable, material ones because they go right to the heart of political trust. “If we don’t care about minorities, we will lose the majority”. Seán Ó Riain, Deputy Ambassador of Ireland to Austria, speaks eight languages and began his talk (“Brexit and the Languages of Europe”) with a poem and song in the Irish language. Ó Riain noted that Jean-Claude Junker liked to use French and German but had jettisoning multilingualism as one of the commissioner competencies (as it had been when Figel was a commissioner). Although Junker has recently gone on record as saying that the role of English in the EU was set to decline, Ó Riain saw no risk to its status as an EU language. It was true that today 13% of EU citizens are native English speakers and that, after Brexit, this will fall to 1%. Nevertheless, English could only lose its place if all the other countries unanimously agreed. It’s not the case that each country can only nominate one language, so the Irish Republic would not have to choose between the Irish language and English. My conclusion: it’s a very good time to be Irish. 2) It’s ok to make mistakes. Head Organiser Lydia Maková had a lot on her plate but that didn’t stop her giving a talk of her own: “Ten things polyglots do differently”. While highly successful language learners all go about it in their own way (some speak from the beginning, others speak only later, some swear by flashcards, others can’t stand them….) they do have some things in common. They seem to prefer self-study and they simplify wherever possible. They are also not afraid to make mistakes. Exhibit A: Steve Kaufmann (who’s learned seventeen languages and counting). The Canadian co-founder of LingQ, Kaufmann was at the Gathering for the first time and gave a very well-attended talk (of which more below). Of mistakes he said: “I don’t care about errors because I’m interested in communicating…….I’m realistic. I’ll make the same mistake week after week after week, even if I’m corrected”. “I aim to make 200 mistakes a day” said another “internet polyglot”, the self-styled “proud imperfectionist” Benny Lewis of Fluent in 3 Months. In his powerful talk on “Daredevil language learning” Lewis showed how he’d turned considerable handicaps such as partial deafness, into strengths. The inimitable Lindsay “Does Languages” Williams delivered a fun, GIF-packed talk “The Joy of Mistakes and the Beauty of Imperfection”. Mistakes are not the same as failure, she said. Each mistake gets you closer to success. Or, in the words of Jake the Dog. “dude, sucking at something is the first step towards being sort of good at something”. You do need corrective feedback though, added Williams. She suggested a site like Lang8 where other members will correct your written work for you. You can also make full use of your tutor. Most of my formal tuition for my Russian writing exam this summer consisted of my teachers racking over my error-strewn written work. Gradually, the number of errors fell. In the words of Lydia Machová, this was a conference for people who enjoy learning languages in their own time (regardless of how many they speak). So, it’s languages as lifestyle and, as usual, there were a number of talks in which speakers set out what that meant, in practice, for them. Kamil Klemsa, for example, was a debut speaker who told how he had left a corporate job to go and study Norwegian. Richard Simcott spoke on “Life in multiple languages”. He learned several languages before and at university but, once the need to earn a living kicked in, he had to make conscious, practical choices to maintain and expand his linguistic repertoire. These included jobs which forced him to keep speaking, focussing on languages that he can use in whatever community he happens to be living and clear decisions on what was necessary to bring up his daughter multilingually. In my own talk, “Fluent in Three Decades? The joys of life-long language learning for beginners….and old hands”, I looked at how to sustain your language learning over the long term. I’ll come back to this later on the site. There are always a good number of talks on methodology and I was struck by two this year, both with different, but maybe complementary messages. Steve Kaufmann said he had never been able to “master the basics” of a language. What he experienced at the beginning was “not building blocks but transient moments of clarity”. He doesn’t like role-playing and can’t get on with flash cards. “Getting people to spit back what you speak to them doesn’t work”. Instead of deliberate “learning activities” Kaufmann prefers “time spent with compelling imput”. That means “no gimmicks”, and stacks of reading and listening as “the two most powerful tools”. You need a mixture of repetition and variation. The goal is to get to a level where you can read and listen interesting material and have interesting conversations. It does take time but “you get to enjoy the process so you don’t care how long it takes”. Answer: it depends. The top one hundred words are much less important than the top one hundred verbs (because the latter will not vary nearly so much according to your interests or topic of conversation). The minimum vocabulary for an upper intermediate level is, argued Kaufmann, at least 15,000 words. In “Learning by Eye vs. Learning by ear: which is better” the multilingual musician and founder of MimicMethod.com, Idahosa Ness, explained how his pronunciation training is inspired by the Suzuki violin school approach to music. Suzuki students start not by reading a music but by getting a feel for the sounds. In the same way, as language learners who want to understand and speak, we shouldn’t start with the written word. We should, rather, train our ear first and develop good pronunciation. It’s about learning to listen,without letting the orthography of your native language get in the way. “If you can’t hear, you can’t understand”. “If you can’t understand, you can’t speak”. First, learn the elemental sounds, then combine them in syllables, then combine these into the melody of the language. Daniel Krasa and Elisa Polese were another two of last year’s speakers I was glad to see on the programme again. This time they joined up to give us an outstandingly rich and entertaining intro to the richness of Neapolitan language and culture. Other talks I enjoyed included Audrius Sabūnas’ about saving threatened languages, which included his run-down of “10 endangered languages popularising superheroes” and the ever-vivacious Kerstin Cable’s “You can be the person who talks to anyone”. She had a host of practical tips, such as aiming to be simply “acceptable” (you don’t have to impress anybody) and saying to the natives “I’m learning your language” rather than “I speak your language”, so as to open the way for correction. Ungenerous voices might sum up too much of the fare as warmed up self-help (cookie-cutter talks on topics such as motivation and time management), rehashed Wikipedia articles and thinly disguised infomercials. There’s some truth in this but you’ll sense that I was as energised and inspired as ever by many of the talks that I heard. Remember, this is not supposed to be an academic conference. There’s a positive encouragement of new speakers even if what they have to say may not be as new as they think. To my mind, that’s fine. The programme is extensive, you can pick and choose according to taste and experience. I’m a junkie for self-help and language overviews in any case and it’s often good to be told what we already know by new faces. I did get talking to a couple of female participants who though critiqued the Gathering from a feminist perspective, pointing out, for example, that there’s a very male competitiveness to that collecting of languages and that most of the “internet Polyglots” sometimes held up as examples are men. Not sure how representative those views were. Looking at the programme I counted thirteen women to thirty-three men speakers and of the 378 participants on the attendance list, I counted 144 women (38% – all rough figures, I had to guess the gender of some participants and not all included their names on the list). One of my conversation partners suggested an “unconference” format (in which there is no programme and no main speakers, with topics bubbling up more freely) might be a more equal way forward. It’s not quite the same thing, but the Gathering does already have the “lightening talks” slot (two one-hour sessions where any participant can put their name down at short notice for an impromptu, five-minute talk). Also, isn’t informal milling around the formal programme, not least in the evenings, already, really, your “unconference”? Would a good starting point would be for more talks expressly from a women’s perspective? Speakers: step forward! Mind your language …or should that be hitzkunza? Another innovation this year was the “No English zone” among some trees just outside the main foyer. It was hung was hammocks and proved quite popular. Discussion bubbled up afterwards on the particpant’s Facebook event group about the language of presentation, with some people sensing deep irony in the predominance of English as the langauge of the public face of the Gathering. From the programme, I counted twelve non-English talk titles. If there’s a problem (and it may be that there isn’t), что делать? I’m always left with the ever so slight suspicion that advocates of Spanish and French would really just like to replace English dominance with their own. It might please Jean-Claude Junker, but I don’t see any less irony in moving from monopoly to oligarchy. Several Facebook posters suggested simultaneous intrepretation. It would take resources and a lot of work but maybe it’s worth a trial (if the people and the equipment are available). I’d just set one condition: we’ll be translating into Hungarian. First, we could have more “token” bilinguialism (English/host country language) in the public face of the event. This year, that would have meant Slovak as well as English signage about the place, on the website, in the programme and the announcements. This would have sat well with the learn Slovak language challenges that ran in the months running up to the Gathering (culminating in two sessions where people could show off their stuff – one for Slavonic participants, one for rest). I find it enough of a stretch to give a talk in my own language, so I’m full of admiration for fellow English natives such as Richard DeLong and Ralph Hurley O’Dwyer who spoke in Russian and French respectively. It goes without saying that I’m also in awe of the many regular speakers who are not natives but for whom English is, though many decades of high-level use, in effect a second “native” language. 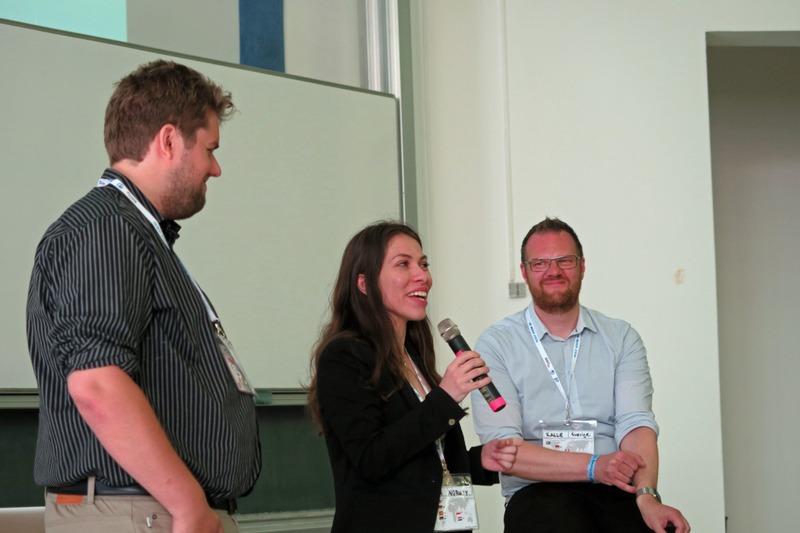 I also take my hat off to those speakers, such as Florian Heller, Cesco Reale and Dmitris Polychronopoulos, who switched between languages during their talks. My second quick fix, though, would be for more of the presenters who don’t have English as their mother tongue to stick to their native languages, at least if they’re widely spoken ones. Get your tanks off our English lawn for a while! Here comes a blood-thirsty answer to the language conundrum. It’s wearing a behorned helmet and sweeping south swinging an axe. Well, actually, Messrs Kris Broholm (Denmark) and Karl-Erik Wångstedt (Sweden) and Ms Irina Dahl (long-time Norwegian resident) were impeccably mannered as they daintily sprinkled cinnamon over the pastries and poured us some strong filter coffee before sharing their insights into “De skandinavsika/skandinaviske språken/språkene/sprog”. The talk was all about the similarities and differences between Swedish, Danish and Norwegian and they each stuck to “their” Scandinavian tongue. No English to be heard. All the same, these are fellow Germanic languages and, thanks to my English and German, and to some helpful slides, I’d say I followed well over half of it and great fun it was too. Northern Highlights. Irina Dahl conquers all before her, with Kris Broholm (left) and Karl-Erik Wångstedt. As Gary Dale said in my final daily vlog, this wasn’t Berlin so why should it be like Berlin? Quand même, as this was the first time the Gathering hasn’t been held at the German capital’s A&O hostel, I’m sure I wasn’t the only one comparing this year’s venue and organisation with what’s gone before. What I found was pretty much ideal: a continuity of a tried and tested format with some tweaks and innovations. Familiar and fun were the international culinary evening, the international concert (performances by attendee volunteers). As last year, one evening there was a multilingual concert from jOmO. This year, in addition, there were free events from two professional performers: the captivating Jessie Ann de Angelo and the magician Florian Heller (who worked through English, German and French). There was always a rush at previous Gatherings to get to the next talk in time, so the decision to schedule a fifteen minute break between each talk was very welcome. As speakers, we’ve always been encouraged to allow enough time for questions, but I liked the additional emphasis on planning to speak for thirty minutes so building in fifteen minutes discussion time. It was great this year that timing was “policed” by volunteer Gathering staff (it seemed to work with every speaker except the one who was on before me. Grrrr. There was also IT support on hand all the time, which removed some of the speaker stress of previous years. The stands selling snacks, freshly ground coffee and fresh juices (plus harder stuff by late afternoon) were also great. Pity most of them weren’t working on the last day (Sunday). Stallholders: it ain’t over till it’s over. If you aren’t in it for the duration, make way for those who would be. The final great memory from a Gathering packed with them was the attempt at the Slovak record for the most languages spoken in one place. I wasn’t planning to take part but got involved at the last minute when it turned out that all of the several Welsh-speakers were doing other lingos. The reason I hadn’t put my name down was that I was full on vlogging a lot of the time. It was the first time I’d done a daily vlog from a language event. It was hard work, but hugely enjoyable, even if I am reaching the limits of what I can do with my camera’s built-in microphone. There’s a taste of the record breaking at the end of the final daily vlog and look out for one dedicated to this soon. This city itself of Bratislava itself was lovely. There’ll be lots of it to see in a “smash and grab” culture vlog on Slovakian that I also have in the pipelines. Don’t tell anyone, but it features that fujara. I loved Bratislava’s cafe and tavern culture and the truly multilingual history of the place (Slovak, Hungarian, German, Yiddish). A big thanks to the organisers for everything, including going even further beyond the call of duty in organising a number of trips during and after the event. The day after we finished, I took the day trip through the beautiful countryside to the romantic Bojnice castle and the castle in the city of Trenčín. Thus ended another Gathering. As things wound down last year, it was uncertain what would happen next. This year we were told there will be a fifth incarnation in 2018, but the location has not yet been decided. I, for one, would be back to Bratislava like a shot. You might also like the Howtogetfluent round-ups of the 2014 Polyglot Gathering, 2015 Polyglot Gathering and the 2016 Polyglot Gathering. There are vlogs from 2016 and 2017. There are reports and vlogs from other language learner events under the Archive tab above. Were you at the Gathering or do you have any questions for the future? Let me know in the comments below! Great review Gareth, and totally echoing my own feelings. It was a fantastic event, and I cannot believe how great of a job Lydia and her team did. Regards to the no-english; Personally for me it’s a massive dilemma. On one hand it is my strongest language, and speaking it with my friends and new acquiaintances allows me to quickly interpret my own thoughts into meaningful words, and it allows me to have great conversations with my friends, many of whom I don’t get to see for the other 359 days of the year! On the other hand I am excited about foreign languages, and I don’t mind speaking them at all if at all possible. As an example when we spoke Russian and Hungarian in the pub, or when I spent most of the week in Slovakia hanging out with a group who had mostly German as the strongest common language. It’s good fun and very challenging, but I would never agree to something like a no-english. That’s not why I go to these things! Regarding the criticism of format and representation of female participants/speakers, well I just don’t see that in reality and can only assume that the people who had this opinion may have carried some prejudice from home. Unless you can point me to some limiting factors inherent in the structure of the gathering, that somehow discriminates female speakers or participants then I’m afraid it’s just nonsense. Granted, it would be fantastic if we could get the numbers up to 50/50 – but if we can’t then I don’t see a problem with it. No reason to strong-arm or enforce quotas just for the sake of added perceived representation. PS: Thanks for the picture of me – I didn’t knew I had gotten this round. Need to shape up!